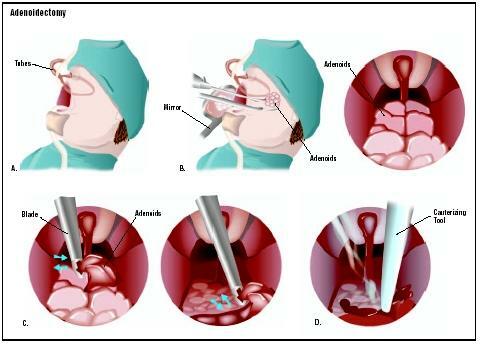 An adenoidectomy is the surgical removal of the adenoids—small lumps of tissue that lie in the back of the throat behind the nose. The adenoids are removed if they block breathing through the nose and if they cause chronic earaches or deafness. The adenoids consist of lymphoid tissue—white blood cells from the immune system. They are located near the tonsils, two other lumps of similar lymphoid tissue. In childhood, adenoids and tonsils are believed to play a role in fighting infections by producing antibodies that attack bacteria entering the body through the mouth and nose. In adulthood however, it is unlikely that the adenoids are involved in maintaining health, and they normally shrink and disappear. Between the ages of two and six, the adenoids can become chronically infected, swelling up and becoming inflamed. This can cause breathing difficulties, especially during sleep. The swelling can also block the eustachian tubes that connect the back of the throat to the ears, leading to hearing problems until the blockage is relieved. The purpose of an adenoidectomy is thus to remove infected adenoids. Since they are often associated with infected tonsils, they are often removed as part of a combined operation that also removes the tonsils, called a T&A ( tonsillectomy and adenoidectomy). Demographics information is difficult to provide because adenoidectomy is routinely performed in an outpatient setting, for which demographic data are not well recorded. Good information is available from the 1970s and 1980s when the surgery was performed in an inpatient setting. In the United States in 1971, more than one million combined T&As, tonsillectomies alone, or adenoidectomies alone were performed, with 50,000 of these procedures consisting of adenoidectomy alone. In 1987, 250,000 combined or single procedures were performed, with 15,000 consisting of adenoidectomy alone. Now, almost all adenoidectomies are performed on an outpatient basis unless other medical problems require hospital admission or an overnight stay. T&A is considered the most common major surgical procedure in the United States. An adenoidectomy is performed under general anesthesia. The surgeon removes the adenoids from behind the palate. Stitches are usually not required. The adenoids are most commonly removed through the mouth after placing an instrument to open the mouth and retract the palate. A mirror is used to see the adenoids behind the nasal cavity. Several instruments can then be used to remove the adenoids. Curette removal. The most common method of removal is using the adenoid curette, an instrument that has a sharp edge in a perpendicular position to its long handle. Various sizes of curettes are available. Adenoid punch instrument. An adenoid punch is a curved instrument with a chamber that is placed over the adenoids. The chamber has a knife blade sliding-door to section off the adenoids that are then housed in the chamber and removed with the instrument. Magill forceps. A Magill forceps is a curved instrument used to remove residual adenoid, usually located deeper in the posterior nasal cavity, after attempted removal with curettes or adenoid punches. Electrocautery with a suction Bovie. The adenoids can also be removed by electrocautery with a suction Bovie, an instrument with a hollow center to suction blood and a rim of metal to achieve coagulation. Laser. The Nd:YAG laser has also been used to remove the adenoids. However, this technique has caused scarring of tissue and is usually avoided. Adenoids may also be removed through the nasal cavity with a surgical suction instrument called a microdebrider. With this procedure, bleeding is controlled either with packing or suction cautery. When the patient arrives at the hospital or the day-surgery unit, a nurse or a doctor will ask questions concerning the patient's general health to make sure he or she is fit to undergo surgery. They will also check that the patient has not had anything to eat or drink and will record pulse and blood pressure. The doctor or nurse must be informed if the patient has had any allergic or unusual reactions to drugs in the past. The patient will be asked to put on a hospital gown and to remove any loose orthodontic braces, false teeth, and jewelry. In the past, an adenoidectomy usually called for an overnight stay in hospital. However, it is increasingly more common to have this operation on an outpatient basis, meaning that the patient goes home on the same day. The surgery is usually performed early in the morning to allow a sufficient observation period after the operation. After surgery, the patient wakes up in the recovery area and is given medication to reduce swelling and pain. When the patient has recovered from surgery, he or she is sent home and usually given a week's course of antibiotics to be taken by mouth. The patient may also develop a sore throat, especially when swallowing or speaking, or moderate pain at the back of the nose and throat, for which pain medication is prescribed. Normally, the pain goes away after a week. A child who has undergone an adenoidectomy should rest at home for at least one week to avoid possible infections at school. Swimming should not be allowed for at least 10 days after the operation. If there is any sign of bleeding or infection (fever, increased pain), the treating physician should be immediately contacted. Risks and complications include those generally associated with surgery and anesthesia. Very few complications are known to occur after this operation, except, very rarely, bleeding (which occurs in 0.4% of cases). Bleeding is more a concern with a very young child because he or she often will not notice. For this reason, a child is always kept in observation at the hospital or clinic for a few hours after the operation. If bleeding does occur, the surgeon may insert a pack of gauze into the nose to stop the blood flow for subsequent removal after a day or two. The other possible complications are those associated with any operation, including infection of the operated area, which may result in light bleeding, increased pain, and fever. Infection is usually treated with antibiotics and bed rest. Adenoidectomy is an operation that has very good outcomes, and patients are expected to make a full and quick recovery once the initial pain has subsided. Adenoid tissue rarely regrows, but some instances have been reported. The exact mechanism is unknown but may be related to incomplete removal. There is no good evidence supporting any curative non-surgical therapy for chronic infection of the adenoid. Antibiotics have been used for as long as six weeks in lymphoid tissue infection, but with failure to eradicate the bacteria. With reported incidences of drug-resistant bacteria, use of long-term antibiotics is not a recommended alternative to surgical removal of infected adenoids. Some studies indicate some benefit from using topical nasal steroids. Studies show that while using the medication, the adenoids may shrink up to 10% and help relieve nasal blockage. However, once the steroid medication is stopped, the adenoids can again enlarge and continue to cause symptoms. In a child with nasal obstructive symptoms, a trial of topical nasal steroid spray and saline spray may be attempted for controlling symptoms. Bluestone, C. D. Pediatric otolaryngology Philadelphia: Saunders, 2003. Lee, K. J. Essential otolaryngology: head and neck surgery. New York: McGraw-Hill Medical Pub. Division, 2003. Markel, H. and F. A. Oski. The Practical Pediatrician: The A to Z Guide to Your Child's Health, Behavior, and Safety. New York: W. H. Freeman and Co., 1995. Felder-Puig, R., A. Maksys, C. Noestlinger, et al. "Using a children's book to prepare children and parents for elective ENT surgery: results of a randomized clinical trial." International Journal of Pediatrics and Otorhinolaryngology 67 (January 2003): 35–41. Homer, J. J., J. Swallow, and P. Semple. " Audit of pain management at home following tonsillectomy in children." Journal of Laryngology and Otology 115 (March 2001): 205–208. Kokki, H. and R. Ahonen. "Pain and activity disturbance after paediatric day case adenoidectomy." Paediatric Anaesthesiology 7 (1997): 227–231. Kvaerner, K. J., P. Nafstad, and J. J. Jaakkola. "Otolaryngological surgery and upper respiratory tract infections in children: an epidemiological study." Annals of Otology, Rhinology and Laryngology 111 (November 2002): 1034–1039. McClay, J. E. "Resistant bacteria in the adenoids: a preliminary report." Archives of Otolaryngology: Head and Neck Surgery 123 (May 2000): 625–629. American College of Surgeons. 633 N. Saint Claire St., Chicago, IL 60611. (312) 202-5000. http://www.faacs.org . American College of Surgeons. "Tonsillectomy and Adenoidectomy." February 21, 2003 [cited April 23, 2003]. http://www.facs.org/public_info/operation/aboutbroch.html . BUPA. "Adenoidectomy." [cited April 23, 2003]. http://www.bupa.com . Texas Pediatric Surgical Associates. "Adenoids and Adenoidectomy." [cited April 23, 2003]. http://www.pedisurg.com/PtEducENT/adenoids.htm . An adenoidectomy is performed by an ENT (ear, nose, and throat) board-certified surgeon. What are the possible complications involved in this type of surgery? Should the tonsils be removed as well? Could my child outgrow the problem? How are adenoids removed in your clinic/hospital? Is there a special diet to be followed after the operation? How much adenoidectomies do you perform each year? I just had this procedure performed, as a 37-year-old. I have mild pain, so the doctor prescribed mild pain medication. I also have a few stitches, but they will dissolve. I'm up and moving around (a little groggy) about 5-6 hours after the procedure (about 3-4 hours after recovery and sleeping a little). Just a note to comfort people who are timid about surgery in the ear, nose & throat. It was not bad. Children may be confused, though, and they just need lots of tender loving care and attention. Cool liquids & Jello help a lot, too! i have a son who will turn 5 in feb 2008. he has post nasal drip which is continous since last one year. He has taken various medication including antibiotics and cough syrups and inhalers but with no effect and therefore always has sputum or blockage in his throat. But his nose is not blocked...he sleeps well and has no breathing problems. E.N.T has prescribed a post nasal x-ray to see if there are any adenoids. I would appreciate if u guide me on this because after reading this article, i came to the conclusion that adenoids cause nose blockage and therefor its necessary to remove them so as to prevent its negative effect on ears and tonsils in future. My son has no nose blockage. his x-ray is due next week. If an adenoid is diagnosed, what should i do? shall i get it removed or take 2nd opinions. Im very scared of letting my child go through a major surgery with general anesthesia. looking forward to your reply. My two sons, 5 and 10, have just had their T&A's removed. Both are doing wonderful. They were released shortly after got back to their room and were almost a little too spunky the next day. The sedation effects of the pain medicine is presumably an added benefit. My advice is to make sure each dose of medicine is given on time even if they don't seem to need it. After a few days, getting up every three hours to admister meds gets rather exhausting. As a single mom, someone to pick up perscritions and meet you at home after the surgery is a huge help too. I am a little worried, and my husband is a lot worried because our daughter, who just turned 1 will have an adenoidectomy with ear tubes next week. She has some hearing loss and though the tubes will relieve the ears immediately, the ears will just keep filling up with fluid because the adenoids are enlarged and blocking 85-90% of the passage through which the fluid would normally drain. Adenoidectomy appears to be our only option. My son had his tonsils and adenoids removed last year with no problems, but he was 6 and a whole lot bigger. I know that it is a common procedure with very little complication, but sometimes I wonder if it would just go away on its own in time. . . I'm 16 and I just had this procedure done yesterday. My nose is completely stuffed. I can't blow my nose for a week, but it is dripping all the time, and I feel lime I'm wiping it with sand paper. I also saw today that I have something in my nose, I'm not sure if it is mucus or not. It's pretty gross. My tongue also hurts because I bit down on it in the middle of the night since I had to sleep sitting up. My throat also hurts a lot. I cannot breathe through my nose, so I was breathing through my mouth at night and my mouth was dry in the morning. Ugh, I feel gross. Anyways, I hope it clears up soon. My 20month old is required to have adnoidectomy and tubes in ears. I was wondering how your little one did in surgery and after. Thank you! My 3 kids had surgery this week to remove adenoids and tubes in the ears. My daughter is 8 and it took her 4 days to recover, my sons (twins) are 4 1/2 and they were fine the very next day. I have come to the conclusion that it depends on age lil ones bounce right back and older ones and adults take a little bit more time to heal. Im glad all my kids did fine with this surgery and I'm hoping they are all able to breathe better now and I wont be buying antibiotics on a regular basis anymore. We are UK-based and our 23-month old son is due to have an adenoidectomy as he's had runny nose since birth. The doctors' have requested we have a x-ray to ascertain the need for the procedure and have prescribed antihistamine in the meantime. Based on all we've read, we know that the surgery will be hitch-free and he'll be well but are wondering if anyone in the UK has undergone this procedure and are willing to share their experience. Thanks. My grandson is 1 and is going to have tubes inserted and his adnenoids removed. He has had chronic earaches since birth. Will he be able to use his sippy cup after surgery? Please read this book :Healing Childhood Ear Infections: Prevention, Home Care, and Alternative Treatment by Dr Schmidt . Our daughter before arriving in USA was very healthy baby and we never used antibiotics before . When we arrive in USA she start to have cuagh , after sinuses and now ear infections . So , now recomendation is to put tubes and remove adenoids . I regret that I have not read this book 3 months ago ,as I believe I could make some changes in her getting beter and do not need any surgeries . She now 3,5, y.o. . Please be aware about source of the problem , mainly it is liquid in the noise , that caused by allergies !!! If you solve this problem , all others will solve itself . Read a book , try not to give immideatly antibiotics , as if you give offten you trapt in a cycle and you have to have surgery as bacteria getting more resistant . Here , in USA I do not like how much antibiotics have given to children for no reason , this leads to much more problems in the future . When I was child and have ear pain , I was never been giving antibiotics , just change in a diet and warming us the ears and it works . can adenoids be a aggrevated by food allergies? i am considering removing them in my 4yr old daughter, but wonder if there is an alternative. and if eating correctly eg. no dairy and sugar, could solve the problem? what are the after effect of adenoid surgery as my son is 5 yrs old and doctors are suggesting for adenoid and tonsils. mucus since, just wondering if most toddlers[he is 2/12] get lots of infection after adenoids are removed until there immune system builds up. My son is 7 yrs old he just had an adenoidectomy for the second time. He has down syndrome but was acting back to normal when we came home after surgery. Why do the adenoids grow back? the doctor prescribed him zamicet for pain and antibiotics for 5 days. they also removed his t tubes. My son , who is 2years 6 months old , is due to have an adeniodectomy in May 2010. He has had dificulties breathing especially when he has a cold, which he seem to suffer from much often. After an X-ray at our local hospital, the doctor said that his adenoids block his nasal passage, 100%. In the doctor's words, " choke of block". I am naturally concerned as a parent. Has anyone got a similar experience and what did they do, particuarly to help their child before the surgery. i have question about this surgery..i have heard babies immunity must be lost from removing the adenoid?is it true? Hi... My son is 4 years old and is scheduled for surgery tomorrow to remove his adenoids. I am very nervous right now because of the risks that the procedure can have, even though it's a very comum surgery. At this excat moment I don't know if I did everything I should've have done to make sure this is the right thing for my son. Since he was born he always has had sinus problems, but no ear infections. His nose is pretty much always congested, dripping or full of green mucous. I've always noticed that he sometimes opens his nostrils a lot too, I think to try to breath better from his nose. Another thing that he has been doing since he was a baby is... let his head drop completely backwards... on my arms as a baby, he used to do a lot of strengh to get his head hung off my arm, and nowadays he might lay down on the coach and let his head fall down at the edge. I always found this behaviour very strange and always complained to the doctors but never got any good explanation for it. It wasn't until he was 3 years old that I realized that that behaviour had something to do with his constant wet nose. It seems to be a consequence of any sinus infection that he goes through, like if some back dripping is happening and is getting in some place that it shouldn't, and for him, tilting his head backwards makes him feel better, or makes him avoid any strange sensation that he might be feeling at the moment at the back of his head. Now at 4 years old, my son says to me that, yes, he needs to do that to make his head feel better. After seen a ENT he was indeed diagnostic with very large adenoids, which 90% of the air passages in his nose are blocked by them. He was then suggested to go for surgery, and it is tomorrow. We never did any x-rays to see things better inside, just doctor examination. I wonder now if I should've have ask for that. I'm always worried if there is more going on than just large adenoids... who can answer that? In one way, I want him to go for surgery so that he can breath better and to see if this strange behaviour stops. Although I am very nervous about the surgery risks as I said before, especially general anesthesia. Or should we don't even think about surgery and wait to see if time would make things get better by its own? But what if things in the back of his nose get worse? Yesterday he got a cold and now is nose is running again and he sounds very congested. Don't know if it's safe for him to go for surgery like this. Is it? I am waiting for tomorrow morning to call the doctor's office before we drive to the hospital. If the surgery goes forward, all I hope is that all goes well! I can not lose the sun of my life! Looking forward to any reply. Thank you! I had an adenoidectomy when I was 10 years old, which was in 1998. I had very severe bleeding and I nearly died. The following year I contracted pneumonia 3 times, bronchitis 2 times, many ear infections I also developed asthma and allergies. One of the doctors who was caring for me after surgery no longer recommends this operation to his patients. About a year ago, my brother had a Dr appointment with this specific Dr for some sinus issues and the Dr told him that many Drs would recommend an adenoidectomy, but years ago he came a across a little girl who had an adenoidectomy and she bled so much that he does not recommend that procedure anymore. The Dr had no clue that I was his sister. I would not recommend this surgery. Every surgery has risk. you need to weigh up the benefits verses the risks. There are studies that can be done to see if the adenoids are really the culprit rather than leaping into it it. I don't think its right for 1 person to not recommend it because they had a bad experience. Tell your story and let your story help the person make up their mind. If your child was obstructing of a night and their carbon dioxide levels were quite high I think you'd think twice about saying no because it can put your childs health at risk. Making an informed decision is the best thing you can do. There are risks with every surgery and every tablet you take. Good luck with your decision. My 3.8yrs son got adenoids and doctor advised for surgery, i am Riyadh, KSA. Today my son gave blood sample for tests and urine too. Nurse told us that when we get reports tomorrow she will arrange appointment for surgery on Thursday morning. I am very ver scared, this is my elder son and since one week i am just reading and reading information about adenoidectomy. He snores a lot and usually he gets sore throat and due to that gets fever lots of times and his nose blocks several times. If anybody from Riyadh, KSA knows any good hospital please suggest me. Coz I got appointment in Obeid Hospital though i can go for Al Hammadi but the doctor in Obeid seems to be experienced i am planning his surgery in Obeid. Requests for instant replies in this regards. How much weight loss can be expected in a 12 year old, after a surgery such as an adenoidectomy/deviated septum repair/turbinate reduction. She has lost 12 pounds in 5 days. 7 day blood clot a lot, very scary taken to ER then transffert to other hospital, stay x 2 day she didnt need any surgery because the bleeding stop ,sience she is been ok normal pain medicines at time, but today 12 days after operation she is coughing really dont know what to do im so scare i regret so much take her tonsils out she was never in too much pain after the operation just normal i suppose then the bleeding, she is ok know i dont know what to expect anyone can can help please..
My son 33 months got his adenoids and tonsils taken out 1 month ago still having problem breathing specially at night. He still have stuffy nose and snoring problem. Anyone have the same issues. Please help. Since early childhood I have had severe allergy problems. I was a loud breather and diagnosed borderline asthmatic. I have also snored loudly even as a child. I was called a sleeping freight train. As I have grown into an adult, I have learned to cope with varying issues like hayfever, severe allergy to cats, and bad sinus headaches. I am now 39. In the last 2 years I have burst an ear drum (extremely painful) and 75% hearing loss out of the same ear the following year. I have also had bad tinnitus (ringing in the ears) in the last 5 years. I finally had my hearing checked to which the test was fine. When I went to the ENT, he said the ears were not infected but when he looked in the nose with a scope, he said that I had some of the largest adenoids he has seen. It was after looking information up on the web that I discovered, over sized adenoids are a cause of a loss of hearing and even tinnitus. I am scheduled to go in for an adenoidectomy in a week and a half. This to me is necessary because I am a music teacher. I understand the risk and different people have different circumstances. Both of my kids have had the proceedure done and it was not pleasant for them. They both had a tonsilectomy and adenoidectomy in the same operation. But we learned much from both of them. My take on it is, you can hear horror stories and success stories, and all proceedures should be taken with caution, but the bottom line is, there is nothing that a doctor can tell you that is 100% sure except that "nothing is 100% sure". I am nervous about the operation, but if my kids can do it...and be fine, then I can be fine, and if there are complications, we will deal with them the best we can. I will come back on later and let you know how it went. My 15 y old son had adenoids removed 3 weeks ago. how long should it take for body to reconfigure that and actually see the results of operations. he was always congested and as of now there is not a tiny bit of a difference. I live in the UK. My 6 year old daughter had her adenoids and tonsils removed at last, 4 days ago with the NHS. She has had sleep apnea for some years and I have notice a difference already. My daughter is suprisingly bouncing back to health, she has a bit of a runny nose and some mild pain. she would like to go back to school but I will follow the doctors instructions just in case of infection. Im so glad she can breath safely in her sleep now. Me and my husband, will too! hello everybody, i am from south africa. my 9 year old son has difficulty breathing at night and recently developed a slight hearing difficulty. the ent specialist advised to do an adenoidectomy and tonsilectomy and then later suggested he have grommets put in. i'm really not too happy about the grommets. can someone please help me? does my child need the grommets? my son had his adenoids removed when he was 3 years old an he is always sniffling but his nose will not run. he has not had a runny nose of any kind since his adenoid sugery. i want to know if this is normal! Hi, my son is 3 1/2 years old and is due for an opperation to take his adenoids out next week,he,s had an opperation 7months ago when he broke his arm.so not a whole year has passed and he,s having the anasetic again.is it ok cause I was worried a bit. Even i have been advised to have a surgery for removing adenoids , i was very much scared still i m as day after tomorrow i m having surgery. i m today ready for this surgery because i read much on adenoids on internet now i m little bit confident that i can do it but still hearing of pain and little bit bleeding after surgery i m scared . let's now see about my experience then only i can advise others. hope you all pray for me, that i shall get well soon and god must give me power to handle this surgery. Hi, I'm in South Africa. My son (2 and half years old) is booked for Adenoids and Grommets in two weeks time. I'm very worried. He had grommets done last year June, and i notcied an ear discharge about two weeks ago. i went back to the ENT, and he indicated that the grommets fell out. He gave him antibiotics for a week, and we went back, he said we should do the adernois and the grommets again. i'm really woried about my baby, i feel that he's still too small to be going through all these operations. Is this normal for his babies his age (2-3 yrs)? Hello, i think after reading some write up here i am a bit confident of my Son who will be having his throat surgery 2 days from now and i am just hoping with this helpful tips right here, I will know exactly what to do, i am confident and i know it's well and i will be back here to give a good news. My 11 year old daughter is suffering from adnoid. the doctor advised us to apply nasal spray for three months. can it be curable with sprays ? untill what age we can wait with out surgery? Hi, i need advised on partial removal or full removal of adinode. Wat r techniques which help in deciding partial or full removal. Does anotmical nose bone issue can cause only partial adinode surgery. Now after having 2 weeks from the operation i come know through normal xray report post nasal space severely narrowed due to adenoid enlargment. Hi All, I am 45 Year Old and deviated septum/ turbinate reduction / adenoid removal / polyps filmy and sinus clean done as single procedure. I suffered most of my life because my problems weren't detected till 4 years ago sept 2010. It took me four years to come to conclusion that there is a chance to get better with surgery or live miserably for rest. I decided to go for surgery. I pigmy faith in very experienced surgeon who is in prime of his practice and very genuine and very busy. Surgery done 7 days ago and I am resting at home. Surgery was piece of cake and if I can go through it then anyone can. Recovery is bit tough in my case because I wasn't aware that adenoids can give you more pain then nose procedure. I felt so good after surgery that I started eating like normal and didn't take pain mess after day one and now I end up with swollen throat which is under control if I take sins meds. Breathing is so good on day seven that I lived best day of my life in bed. Please get the best surgeon if possible because every surgery can have complications. I didn't want a surgeon who cost bit less but does 10 surgeries in a day. It's best to pay bit more and wait but get the job done with minimum risks. I will keep you posted on as to how I go because new journey is just started. Good luck and trust me surgery is easy bit if surgeon is good . BTW my surgery was done is Australia. My son just got adenoids removed 2days ago because of constant green sticky snot and he breathed through his mouth all the time, he also got grommets but since op his hearing improved emensly but green stick snot still a problem. Is this Common for a certain period after removal or should this have stopped by now? He seems to have started snoring loud but through his nose. What should I do? i JUST HAD AN ADENOIDECTOMY REVISION YESTERDAY. COULDN'T BREATHE AND SNORED TERRIBLY. PROCEDURE WENT FINE. HAVE A BAD SORE THROAT AND A MIGRAINE, BUT THE LIQUID PAIN MEDS THEY GAVE ME ARE WORKING GOOD. HARD PART, CAN'T BLOW MY NOSE FOR TWO WEEKS. HARD TO ASK BECAUSE IT FEELS LIKE IT'S WEEPING ALL THE TIME. 6 months after my adenoid removal surgery I am still having pain in the ears and back of the nose as if I just got them removed but it wasnt until a few days ago that it started coming back and I don't know what is wrong. I am a 16 year old and am going to get this surgery after years of waiting to find out what’s wrong. 3.5 years ago I was diagnosed with chronic sinusitis. Which is an infection in the nose that doesn’t go away with antibiotics. Every time it was fully gone I would get it again because I could not blow all of my snot out of my nose. So I got prescribed to use a saline spray and medicated spray twice daily but this was not a long term solution. So after a while with that not helping I went for allergy and immunodeficiency testing but still NOTHING. Then my immuneologist had an idea that the problem may be structural. That’s when I ended in the ENTs office. Turns out my adenoids block almost my entire nose. 95% blockage. And my tubanites also are causing problems at the front there is 85% blockage. So all in all I can barely breath. I always snore, wake up from gasping for breath finally an answer. I am praying that this surgery is the end of it.